The hike to Hidden Arch is just over a mile to do a round trip. It's located on the east side of Zion National Park, near the impressive park landmark, Checkerboard Mesa. The trail travels through a wash and over slickrock to a jug arch, and then returns back on the same route to the Checkerboard Mesa parking lot. Please stay on the beaten path to avoid damage to the environment. Trail Distance: 1.2 miles round trip. Average Hiking Time: 2 hours round trip. Equipment: At least 2 quarts of water per person, comfortable, sticky rubber hiking shoes, energy food, clothing appropriate for the weather, first aid and emergency gear. Difficulty: Moderate because it's an off trail route, but the hiking is not exerting. Route finding skills required. Sun Exposure: Full sun in most places. This is a hot trail when hiking in the summer, but its nice early or late in the day. Trail Conditions: This is a usually dry, sandy, rocky wash with intermittent sections of slickrock scrambling. It can be muddy if its been wet. Trailhead: Checkerboard Mesa parking lot. Located just southwest of the east entrance to the park. Trail Access: The trail begins just off Zion-Mt. Carmel Highway , which is open year-round, 24 hours a day, allowing access to this trail. Best Season: This is a year-round hike, but take care not to hike in the hottest hours of a summer day. Water availability: None along the route. This hike is in full sun, do not go without plenty of water. Restrooms: Vault Toilets are located, off the road, by the east toll booth. Drive to the east side of Zion and park at the Checkerboard Mesa parking lot. The lot is just south of the east park entrance. The trail begins at the far northeast corner of the rock wall. Look over the end of the wall to locate the path of use. Follow the sandy trail down into the usually dry waterway. Once in the creek bed, turn left (downstream). Shortly, the creek-bed will split. Take the fork on the right (not the fork that parallels the road). Walk up the creek bed for .3 mile until the dry stream bed turns northeasterly. A low angle slickrock wash enters from the left. Leave the creek bed and hike up the slickrock wash toward the mountain on the left, staying in the water course. After approximately .25 mile the path gets a little more difficult to follow. Leave the shallow wash and steer left toward the ridge top. There is some minor scrambling over the slickrock. Walk to the top of the hill and hike to the fallen tree. From that point examine the mountain to the right. The arch is high at the top and angled so it is not easy to see at first. Return back on the same path, staying on the trail. This area has *cryptobiotic soil that is easily damaged by straying off the trail. Although Hidden Arch can be seen from Zion-Mt. Carmel highway, it was not discovered until a Zion National Park Ranger, Ron Kay, found it in 1998. Ron Kay is a seasonal ranger at the park and teaches at the Zion Field Institute. 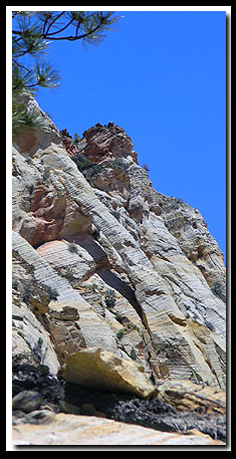 Best Trail features: The east side of Zion is characterized by slickrock and hoodoos with a few natural arches among its treasures. This arch is one of the two jug arches in the park. *Cryptobiotic soil is one of the oldest living forms of life. If damaged it can take several decades to repair itself. The crusty ground cover is made up of mostly cyanobacteria. Algae, lichens, moss, bacteria and microfungi are also involved in the makeup. Long ago these were responsible for changing the earths original atmosphere - one that is filled with life sustaining oxygen. Hidden Arch is aptly named. The Jug Arch is at the top of the mountain and set at an angle that makes it hard to see. Beta: Coordinates and other trail and canyoneering information by Zion Park search and rescue veteran team member Bo Beck and www.zionnational-park.com author Tanya Milligan. 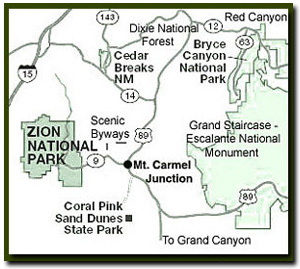 Bo and Tanya are also the authors of the Zion area guide: Favorite hikes in and around Zion National Park. The book includes Zion, Bryce, Grand Canyon, Cedar Breaks, Cedar Mountain, Coyote Buttes, Slot Canyons and much more. Suggested Gear: A sturdy pair of shoes are recommend to hike the trails in Zion National Park. Quality shoes will help grip the rocks and prevent injury and are important to wear whenever exploring anywhere outside the classic hikes in Zion National Park.